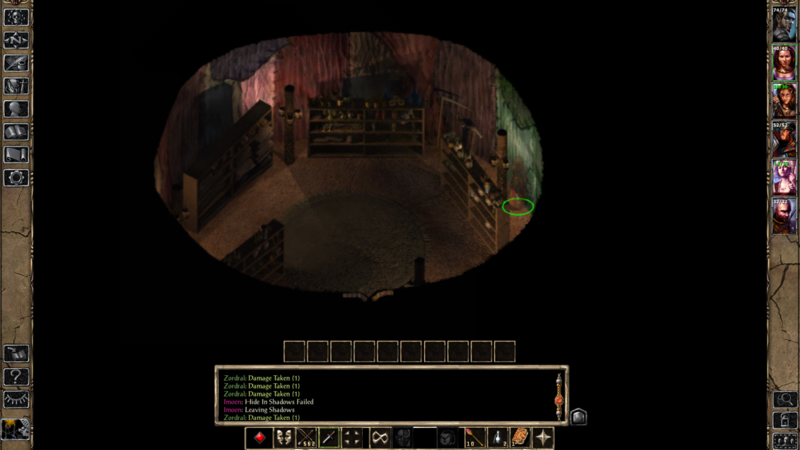 So I never finished my half-orc fighter/mage/thief playthrough a few months back because I got up to the City-of-Caverns then I tried messing around with my mods while on vacation and accidentally overrode my backups so I couldn't do anything when my game got wrecked. Since then I haven't really had the motivation to start over and I've mostly been modding here and there. Now that I'm feeling up for a bit of a challenge again I took the time to rebuild my game and start over. 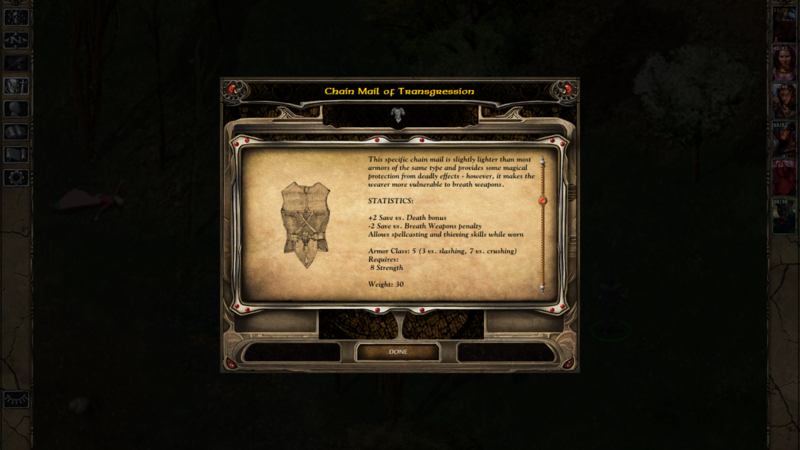 Legacy of Bhaal - I've developed a bit of a love/hate relationship with this setting. Although I still think it's horribly flawed I've found a certain thrill in overcoming the starting difficulty and making my way to the top. This time I'm doing it proper by keeping double damage on and having regular xp progression. Since I'm not playing a triple-class this time I think doubled experience is overkill. Ascension - Assuming I ever get there. I enjoy ToB unlike most so this is the part that I'm actually looking forward to. I'm not all too keen on enforcing rules. Most of the time I end up breaking them anyhow. Nonetheless, I'm keeping this playthrough as roleplay-oriented as possible, so powergaming is kept within the realm of reason. That said I'm still going to have to abuse a few tricks here and there because I'm really not that good. I have used this character over the course of several years and he is still by far my favorite. This time I designed a fitting (albeit super cheap) kit for him. 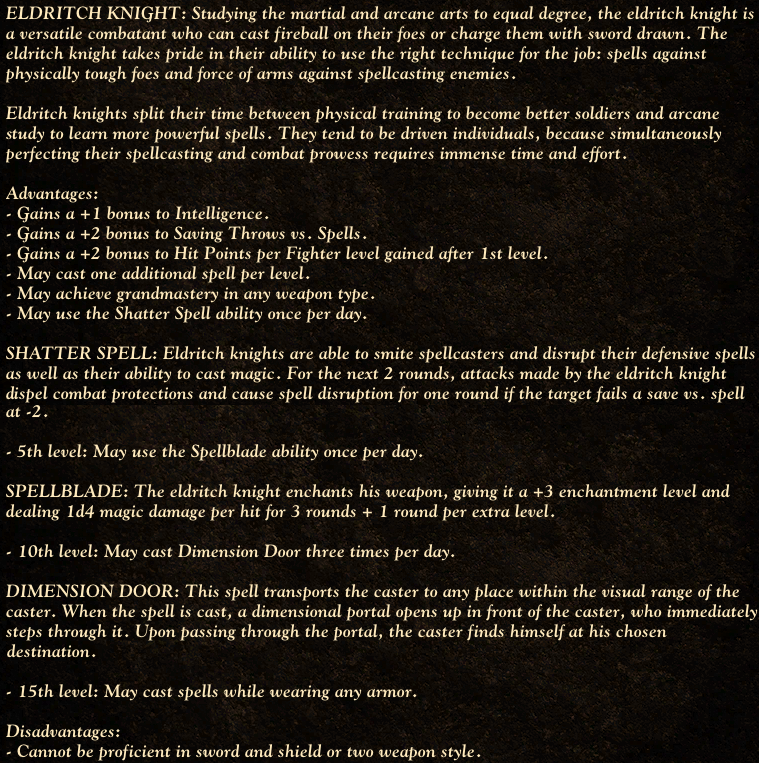 The innate bonuses are pretty big but I don't think the abilities will make or break fights that often. Maybe Shatter Spell will turn the tides of a mage battle here and there. The other two are kind of just cool to have. I'll see how far I get this time. Hopefully, so long as I've learned my lesson, no more technical issues will mess up the run for me. 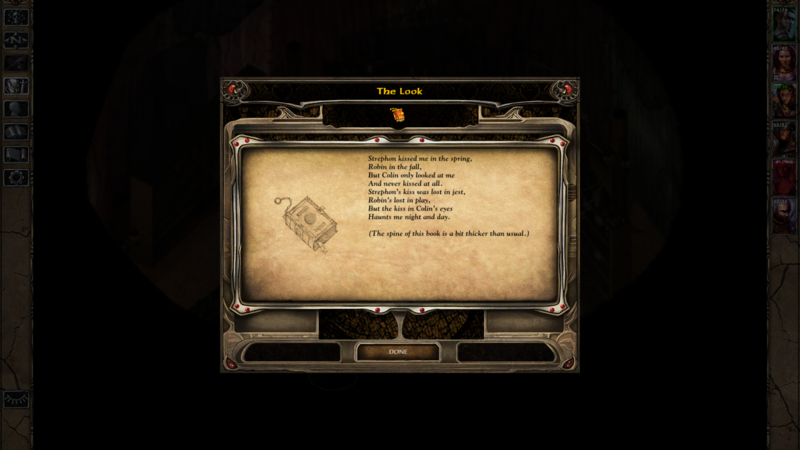 Candlekeep and Friendly Arm Inn were cleared quickly. Jaheira and Khalid are picked up as mainstays as Jaheira's summons will carry the party through the early phases while Khalid will be a solid tank later on. After arriving at Beregost, the party travels east to the Sharp Teeth Plains to go basilisk hunting with the help of the fairy dragon familiar, earning a good dose of experience and some decent items. No screenshots up to this point unfortunately. 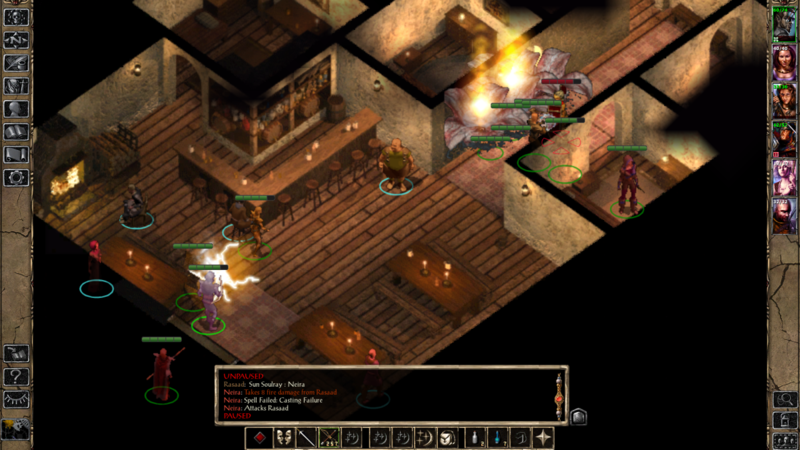 The party then return to Beregost, where they encounter a local who's put himself in a sticky situation. 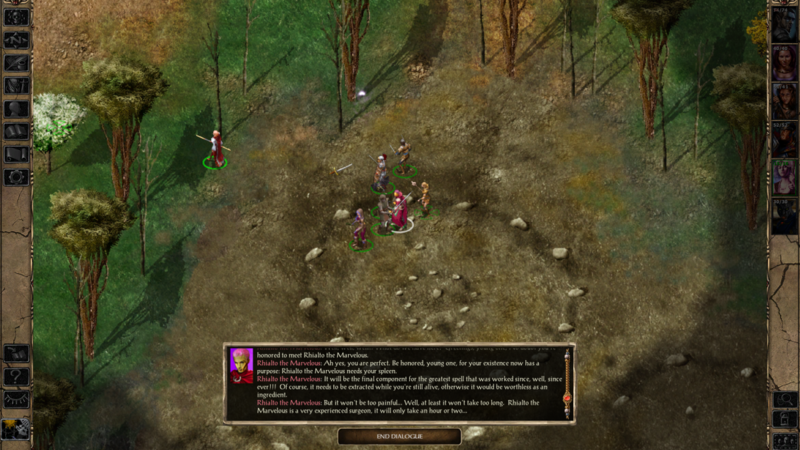 Naturally, the heroic party agrees to helping him. Of course, they'll have to deal with Karlat at the Red Sheaf first. 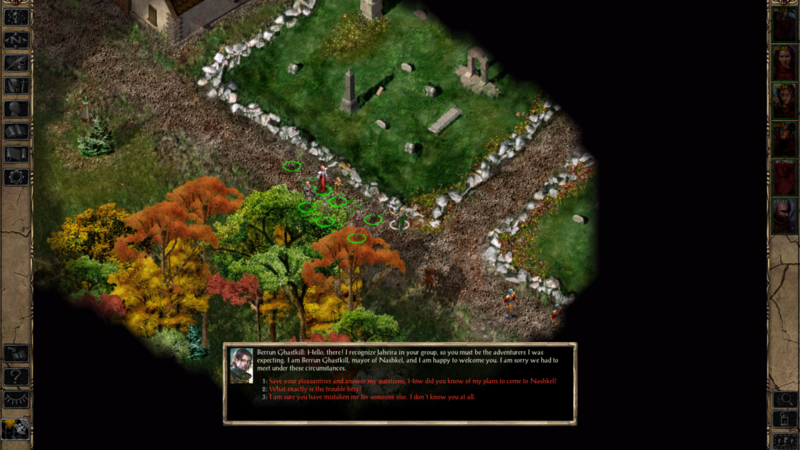 Imoen is using the Dagger of Venom here. 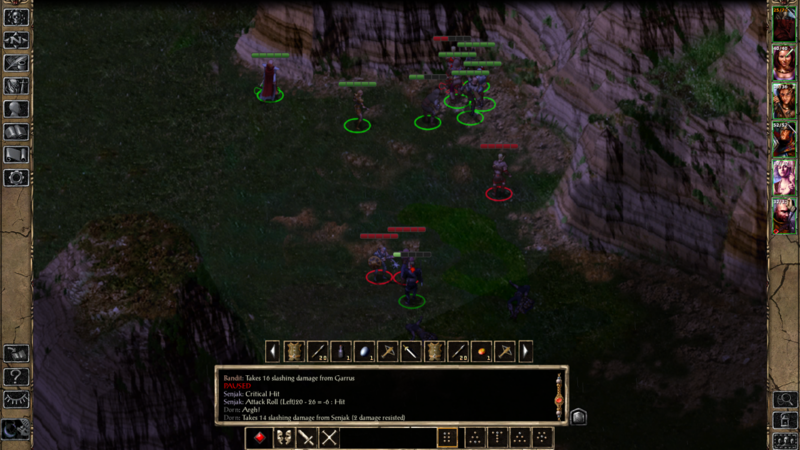 Note that Karlat was held by the backstab. I decided to try something different this time rather than playing her as a standard thief dual-classed to mage in BG1, as EET will transfer her BG1 levels into BG2 so I want to invest more into her thief levels. She is using my assassin rework with the paralysis backstab effect. I don't think this is overpowered because with a +2 modifier and enemies' saving throws this is actually the second time it's worked this whole game (silencing backstab was used successfully against Tarnesh). 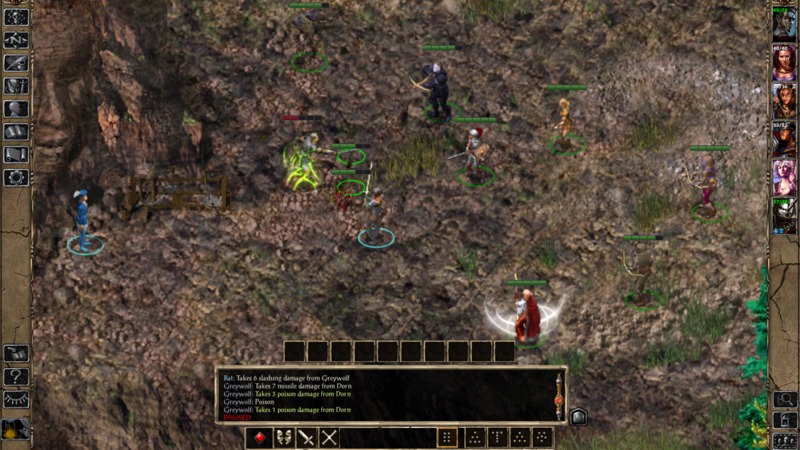 Imoen's low strength means her kit abilities are more used for utility rather than raw damage. I may keep her as an assassin for the entire game or dual-class her to have a secondary mage at a higher level, not sure yet. A happy ending for all. Well, except Karlat. 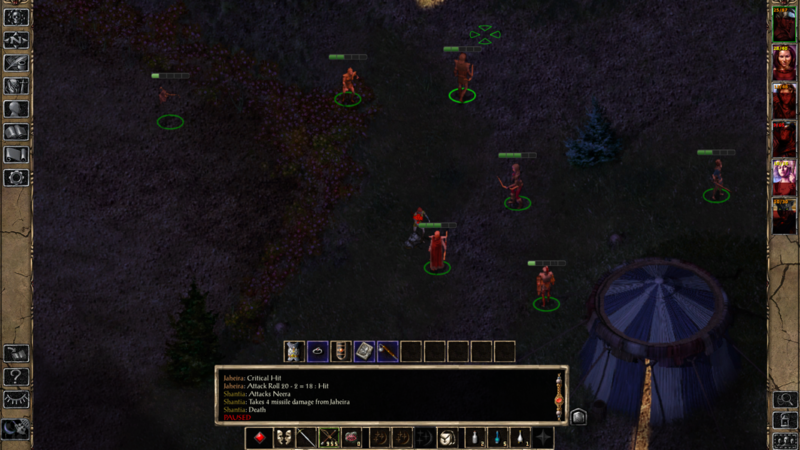 Exterminating the spiders brings Imoen up to level five, giving her the handy Hidden Blade passive. With everything dealt with, at least for now, the party makes the journey south. It turns out that NPCs have a surprisingly vibrant variety of colors after I modded non-magical armors to display character colors. Check out the shiny gold armor of these Amnian soldiers. 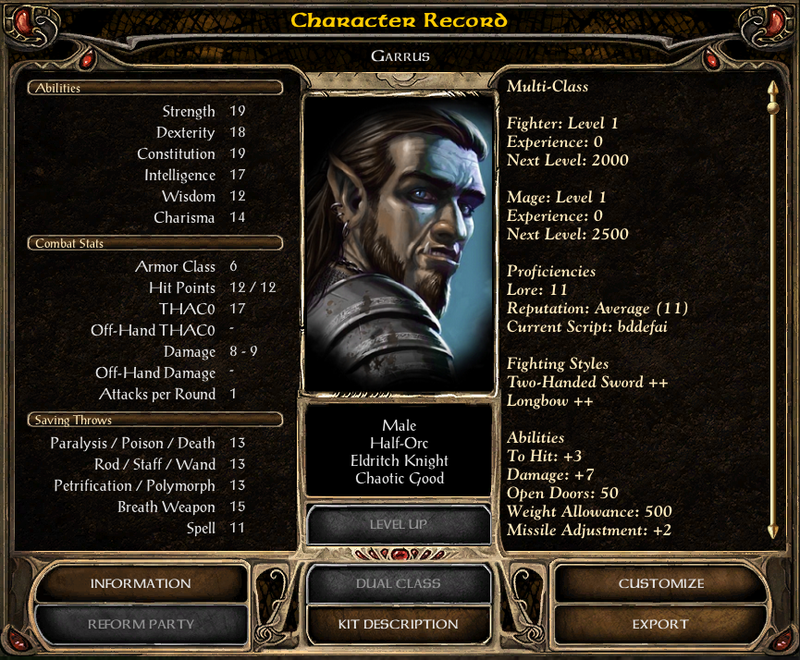 We add Rasaad to our party for the moment. 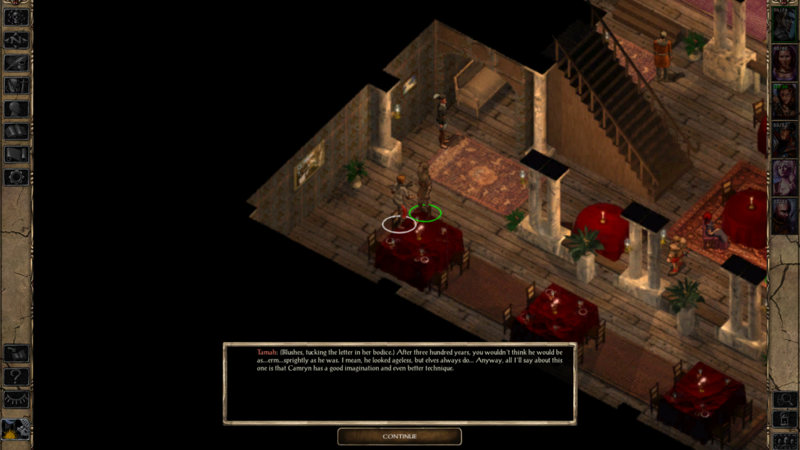 Not planning on keeping him but I want his dialogues so that his quest will start once we reach Baldur's Gate. He does make a surprisingly good first impression by stopping Neira's Unholy Blight from wiping my party though. We travel eastwards to check out the carnival. Of course it's not a real show without some blood being spilled at the end of the day. We even manage to win some gold along the way. 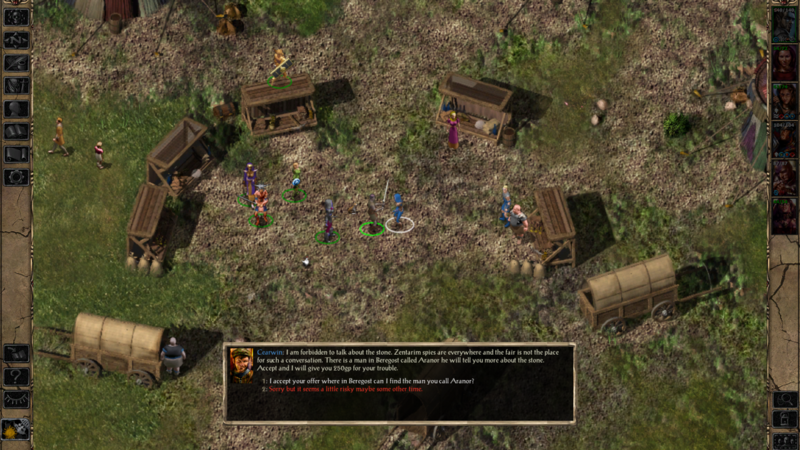 The tent with Zordral and Bentha had another one of BG1RE's books, as well as another love letter. We make our way back to town and save a little boy from a wyvern. Little wyvern vs. Big wyvern! 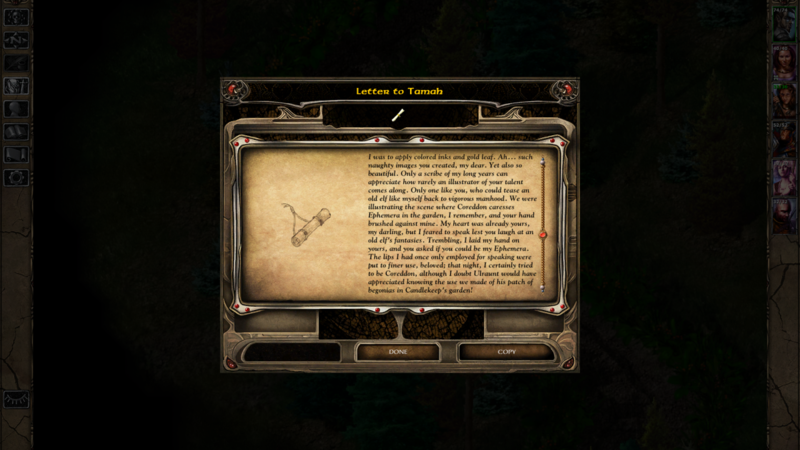 We return to Beregost to deliver the letter to Tamah. She found the contents rather embarrassing. 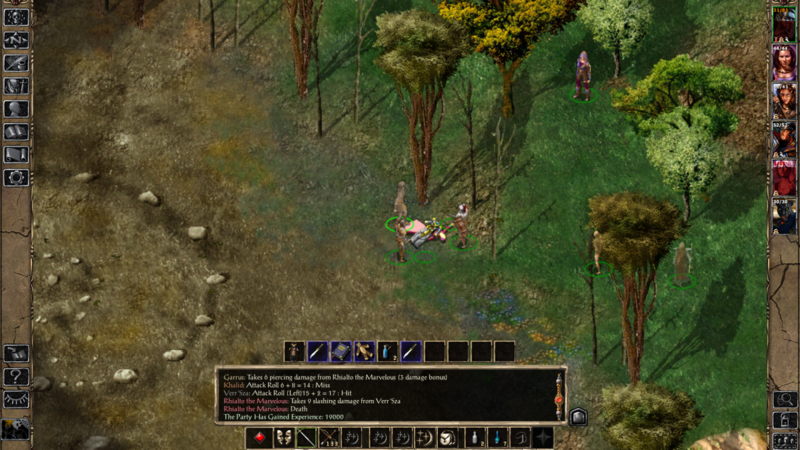 We then travel back towards Nashkel, taking a wrong turn (on purpose) getting a nice Two-Handed Sword +1 for our trouble. I put the cursed Gauntlets of Might (Item Revisions altered Gauntlets of Fumbling) on Rasaad. It does penalize his AC by 2 (which is made up for by his boots) and THAC0 by 1 but bumps his Strength up to the sweet spot of 19. Not that it makes much difference at the moment, since I then exchanged him for Dorn. 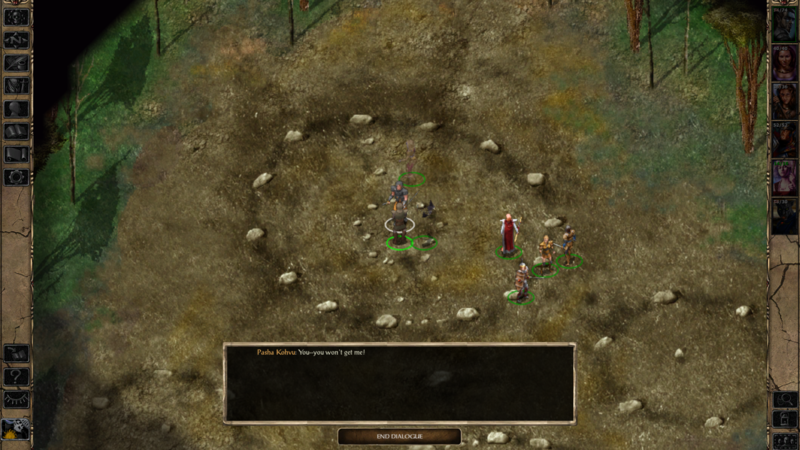 Immediately upon un-stoning him, Verr demands that we return to the stone circles where an enemy of his is waiting. Since this guy is a copy of Nimbul he's fairly tough at this point, but our fairy dragon eats his spells up with ease and he goes down eventually, also giving us a nice suit of chain mail. The Chain Mail of Transgression allows casting so it'd be great for Garrus, but I give it to Verr for now. A dialogue occurs with Verr and we are forced to rest. Upon waking, we are greeted with this wild maniac. A glyph of wild magic is a powerful inscription magically drawn on the ground or any other surface. The glyph will remain there until someone comes too close, at which point it will explode and create one weave disturbance for each creature within a 30' radius. 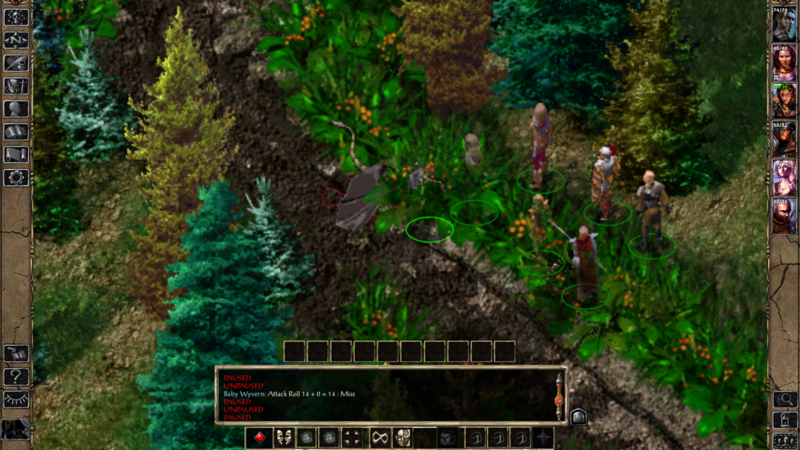 Each disturbance causes a multitude of wild surges, targeted at random creatures (including the caster, should he still be nearby). For every 10 experience levels of the caster, the disturbances remain in existence for 1 round, though it is possible to dispell them prematurely by causing a distortion with physical or magical means. Naturally, the spell's outcome is completely random. Victims can be strengthened by the wild surges, or they can be completely annihilated. 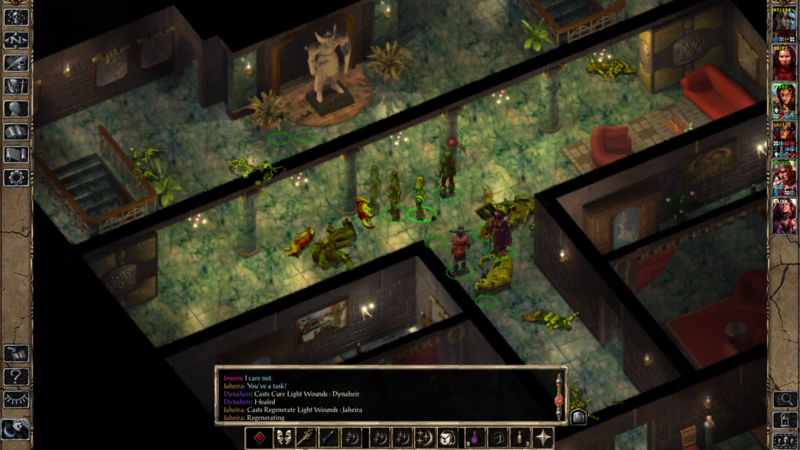 The larger the number of creatures within the area of effect, the more chaotic the outcome, and the higher the probability that the glyph will cause a lot of damage. Taking a break for now as my brain recovers from "WTF-did-I-just-witness" mode. 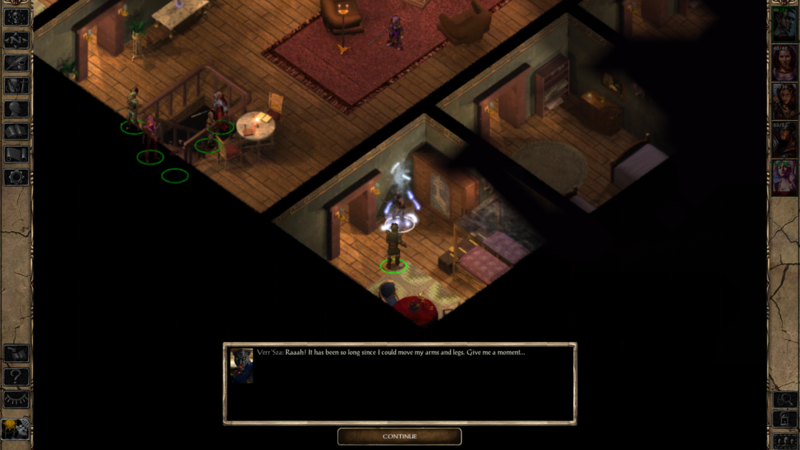 We get quests from both Neera and Verr after travelling with them for a while. We decide to go for Verr's first as it's closer. We remove Verr afterwards. I wasn't going to keep him anyways but he's been underperforming and frankly, I don't need him either. 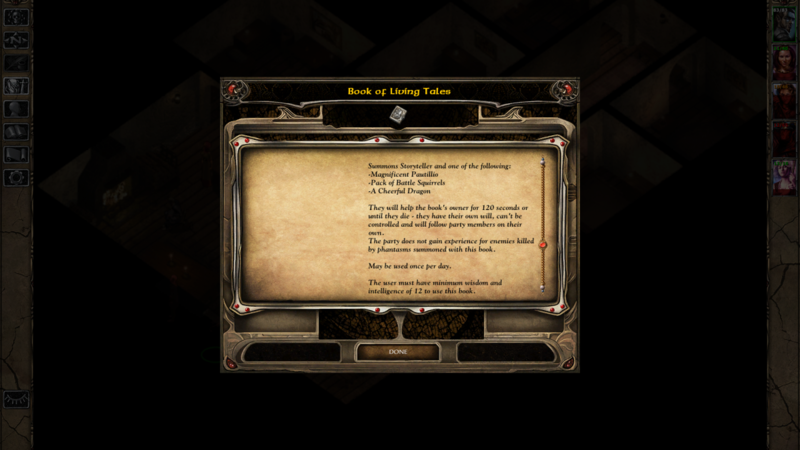 So now we pass through the Firewine Ruins as a party of five, and decide to test out our new magical book on Kahrk. They really didn't accomplish much. 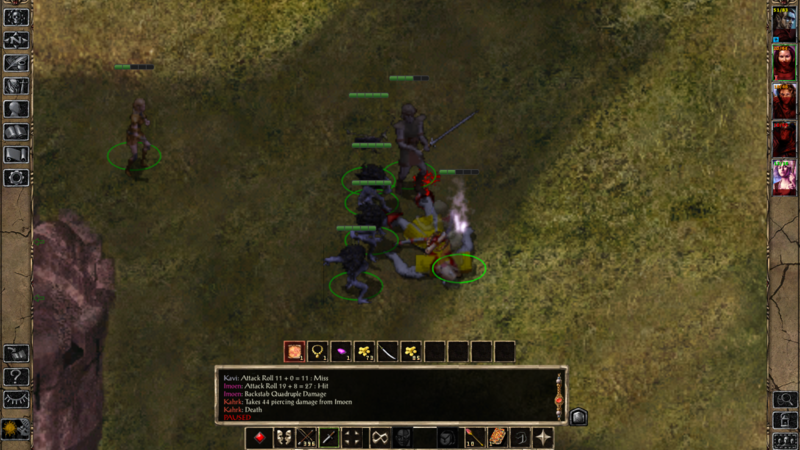 Even with their high hit points, I still ended up having to kite Kahrk around for five minutes to wear out his spells before quaffing two Potions of Invulnerability to tank his blows while Imoen eventually backstabbed him to death. 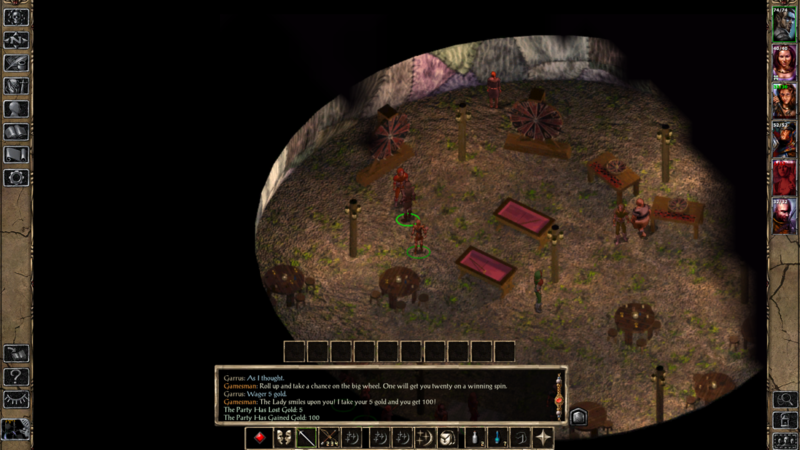 We proceed towards Adoy's Enclave, complete Neera's quest, and pick up the Stoneskin scroll for Garrus. I don't plan on keeping Neera around for much longer, but she can stay for now as I don't really have anyone to replace her with at the moment. Ugh. Finally wiped out the whole Bandit Camp in one battle. Third successful attempt of my life. 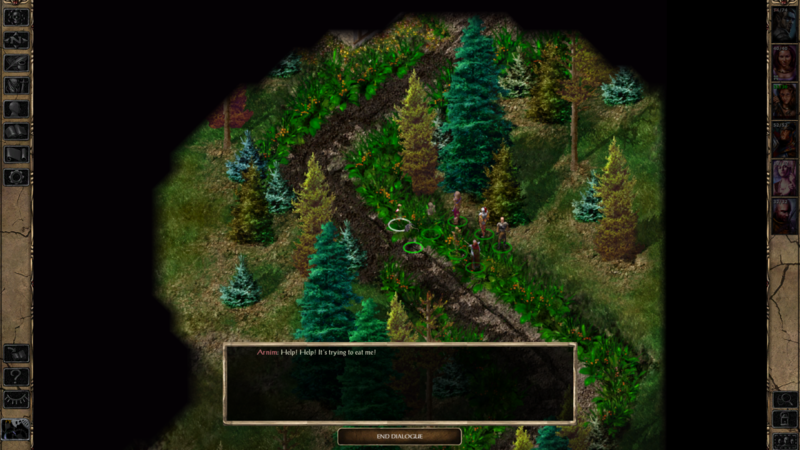 Notably, the only time I didn't have a dedicated archer, and it was by far the most difficult, even after finding a new chokepoint to make things easier. Party is around level 6-7. I hate this fight with the burning rage of a thousand suns. What's already one of the most unfair battles in the entire game considering the party's awful starting position and the enemies' plethora of area of effect spells is made worse by the fact that said spells are almost impossible to interrupt. Occasionally one of the casters will take a dozen hits yet still get their spell off successfully. Good thing I have a beefed up invincible Khalid. 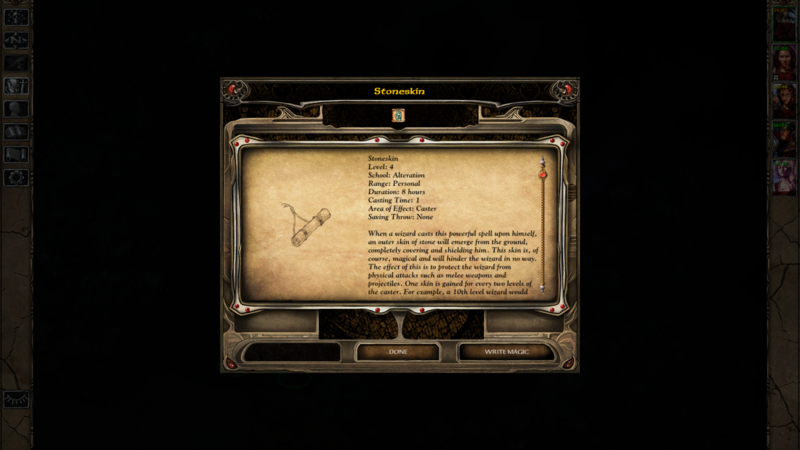 I have encountered the content of the Stone of Askavar mod, which I have never used before. This is a new experience. Though the absence of proper punctuation is triggering me.